This version will only run through the end of the month. It includes one 6 site outing, enough to get a sample of the improved graphics, etc. When it releases, the plan is to keep the core app free, and offer a subscription that delivers a new river (a 6 site outing) each week. Installation of content will be much simpler - you'll just view your available add-ons and tap "download". I still shoot 10 to 20+ sites for every outing, but I'm picking only the best six sites of each to publish, favoring quality over quantity, in terms of sites. In terms of outings, I'm going for both quality and quantity. I've shot nearly 100 rivers for this version over the past two years. I have a lot of work to do to complete those outings, and plan to shoot many more in the next couple of years. Again, this version requires Windows 8 or 10. I'll release a beta for Android in the next week or two. If you're used to the 1024x768 graphics of RWFF, I think you'll find the 1920x1080 to be a whole lot sharper. Hopefully the water flow will look a lot smoother to you, too. If you have a chance to try this over the next week, please let me know if you encounter any problems, if the new interface seems comfortable, and any impressions in general. 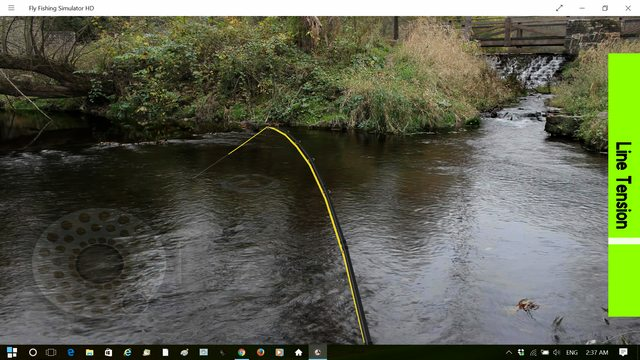 I hope all those who have Windows 10 would have downloaded Paul's new Flyfishing Simulator HD Beta and gave it a test run. No questions about it, it is beautifully made and my hearty congratulations to Paul for creating this HD new App for Windows and smart phones. It should get many users as iphones and Android systems are now very popular and people enjoy playing their games right on these phones and tablets. As the App is still in Beta stage (meaning a test model not totally finalized for public release) I could see where some improvements can be made and these are my suggestions. 1)The water flow and the HD pictures are fantastic and greatly add to the realism of the scenes. However, I found the "reel" mechanism image a bit too large and the transparency almost ghostly. If this could be made a little smaller in relation to the screen, and more transparent, or even less transparent. this will help blend it better with the natural surroundings. Of course this is purely an appearance and aesthetic thing and Paul's decision will be final. Those are just my humble observations. 2)I like the idea of having to select the right fly of the right size before you can catch a fish. Let me tell you, this fishing in this Beta release is not easy at all. Perhaps this can be made a little easier for the introductory scenes and become more difficult in the later stages. I think this will help keep the attention, and retain the interest of future user a little longer. 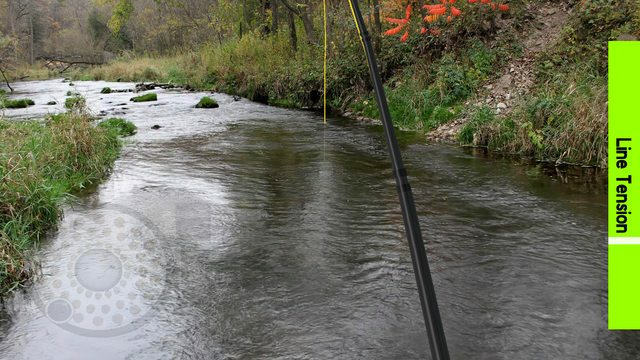 Right now it is a perfect simulation for those who fish in these streams under average conditions. 3)I tried the Beta version on my 13 inch Lenovo Laptop running Windows 10. I had a hard time keeping the rod movements (via the mouse movements) out of the top bar and the bottom where the quick launch bar is located as the rod needed to be back and forth to effect the cast.. (the movement with your mouse is actually up and down if you get what I mean), this sometimes will accidentally open up the icons at the bottom with a fast acting laptop and a sensitive quick mouse setting. If there is a way to keep the mouse movements within the fishing scene itself it will be a great help. 4)Other than that the new Beta showed a lot of refinement and beauty. As someone who love jumping trout species I would like to see the fish breaking water at least a couple of times before being landed. this will add further to the realism of this excellent piece of fishing software. Well, those are my first impressions after trying out the new Flyfishing Simulator HD. It is now much more of a "simulator" than a fishing game and this will please the purists to no end. Here are some screen shots of the new Beta version. Beautiful, isn't it? However, these static screen shots does not do it justice at all. Please download the Beta and see for yourself. The reel is there mostly for the benefit of touch screen users. You can use it with a mouse, too. Click and hold and turn the reel to take line in or out, or click and drag up or down along the left side of the screen to strip line in or out faster. On Windows there's the option of using keys to control the reel, and the tutorial teaches that method. You can change the visibility of the reel from the main menu. My favorite setting is "touch", which hides the reel when not in use, but makes it opaque when you're using it. That way it's out of the way, but when touching it to turn it you can see what you're doing. I'm still tweaking the difficulty levels. It doesn't currently have options for that, but I think I'll add the beginner, intermediate and expert levels like RWFF has, default to beginner, and make the fish less picky, especially in the first few outings. I could not find any other glitches other than one's Stanley has found. by catching the fish and getting New Flies,All Round a Fantastic Job Done by Paul. I just added the link to the Game to my taskbar and one click gets me Fishing,Great. I had to put my Windows 10 desktop away in preparation for my grand children's visit,vacating the extra dinning room table which had become my computer work bench. Anyway I have a couple of suggestions which may or may not be relevant to the new Flyfishing Simulator HD. 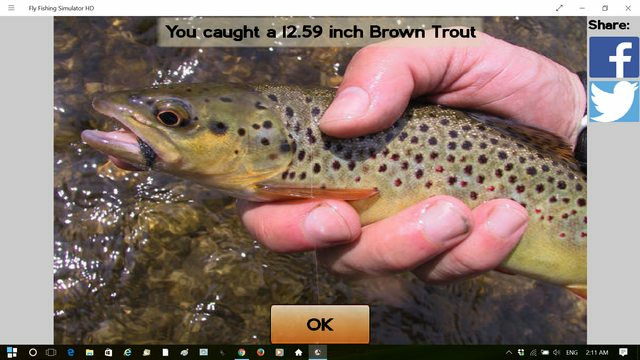 It is an aesthetic thing but I think the text style, and the general appearance of the new Flyfishing Simulator HD looks a little outdated as the move recently has been toward a minimalist type of interface. This is evident in Windows as well as many utilities and software as well. To be more specific, I think the "line tension" bar on the right side of the screen is too big and this detracts from the general appearance of the fishing scenes. Maybe it can be made a little slimmer and more 3D looking, instead of being big and flat as it is. The other mod that I would do would be the Orvis, Scientific Angler type reel shadow on the left bottom of the scenes. Maybe it can be substituted by the use of simple circular directional arrows? This will give the touch screen folks the same functionality but will make the interface look much more modern. One other thing I would look into would be a more modern text style in all the notification bars and windows. Those are just some of my own observations and the final decision is up to Paul, of course. Even with everything the way it is, the new software is heads and shoulders above the dated RWFF version in so many ways. Easy of install and use is a huge improvement and makes it much more user friendly for most fishing folks. Like Martin said, just put an icon on your quick launch bar and you are off fishing. That is really cool! Looking forward to test the final version. I have a couple of laptops running Windows 10 so this will not be a huge problem. just found time to check out the forum...looks like i have missed the boat on Paul's latest version trial, a heavy price to pay for the increasing workload i have. I'll upload a new Windows beta to the store today, with the same content as the Android beta, that will work through the 14th. It seems to take 3 days for an app to show up on the Windows Store, though. I guess I'm outa luck? I have Windows Pro 7. Unfortunately, yes. The new version is built on a system that allows me to maintain one code base and export projects for building the Windows, Android, iOS and even (though I haven't tried it yet) Mac versions. It creates Windows projects that are set up for the Windows Store, and for Windows 8 and newer. Personally I consider the upgrade from 7 to 10 to be worth doing. It has a few drawbacks, but is generally quite stable and flexible. Unlike Windows 8... I think that was a huge step backwards for Windows, but I'm quite happy with 10.
to Windows Pro 7 a couple years ago. My next upgrade will be to Windows 10.